Download video from internet up to 500% faster. Video Downloader is a multi-thread video download application. It is the easiest and the fastest way to download your favorite videos from video sites! 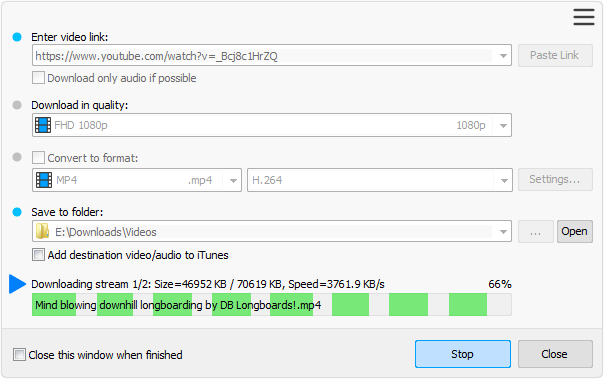 Video Downloader features a multi-thread acceleration engine. It increases your download speeds by up to 500%, or even more! Video Downloader allows you to save videos as any format for any device, so you can watch them on your PC, iPhone, iPad, Android phones and other devices. Optionally, Video Downloader automatically adds downloaded video/music to your iTunes library, so you can easily synchronize your videos and music to your iPhone, iPad, iPod. More Features | Try It for Free!